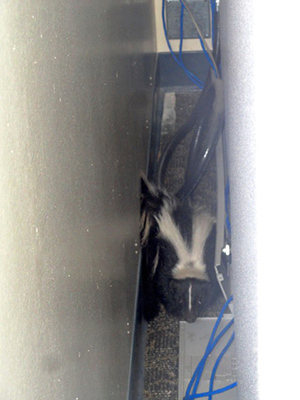 This morning we were called about a skunk that was seen inside an office building. It wondered inside the building through a door that was left open and then apparently lost its way within the labyrinth of cubicles. It took shelter in a corner office. Workers closed the door and posted warning signs. 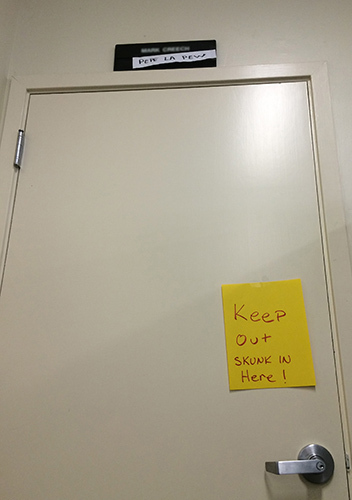 When we arrived, we found the adult skunk tucked back behind a large work station. The animal was bright and alert but unwilling to budge from its corner hiding spot. We decided to hold off until nightfall when the skunk would be more apt to move. Meanwhile, workers offered to bring in large sheets of plywood to build a corridor leading from the back corner office through the building to the closest exit. A good plan! Duane and I returned after dark to find the plywood in place, creating a clear passage to the outside, but the skunk was still in its hiding spot. Skunks can be very stubborn and difficult to move. Why should they comply, right? Skunks will tolerate an extreme amount of quiet nudging and poking and prodding without giving an inch. But air - breath - can sometimes get animals to move on. We decided to give that a try rather than risk more aggressive tactics. We rigged a delivery system using a very long piece of thin plastic tubing - like you'd find at an aquarium store, and we attached it to a strip of wood. Duane positioned the tip of the tube at the skunk's lower back region and gave it a little puff. Without lifting its tail, the skunk moved forward about three feet. After a few seconds, another puff of air sent the skunk out from behind the unit - it shot out of the office, down the corridor and out through the open doors. YES! Outside, the skunk seemed to know right where it was as it shimmied through openings in a fence and off into the night where it belonged.